For the first time since the 2011-12 campaign the Arizona Coyotes could find themselves in the NHL post-season after surging down the stretch. With 11 games to go in the regular campaign the Coyotes are five points ahead of the Minnesota Wild as the two teams battle for the second Wild Card in the Western Conference. Vinnie Hinostroza scored a hat-trick for the hosts at the Gila River Arena in Glendale on Thursday as they easily defeated the struggling and very disappointing Anaheim Ducks 6-1. 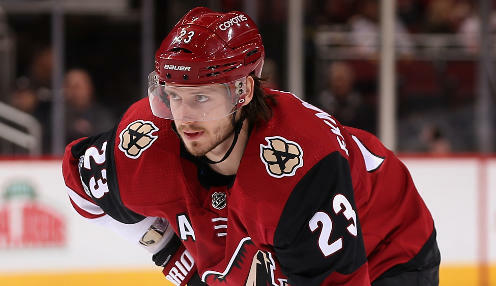 Oliver Ekman-Larsson, Jason Demers and Mario Kempe rounded out the scoring for Arizona, who are 8-2-0 in their last 10 games and rather stunningly the form team in the Conference over that timeframe. Saturday, the Coyotes welcome the Edmonton Oilers into town before a potentially tricky four-game road swing through the Eastern Conference. Arizona plays five of its remaining 11 games at home including a visit from the Wild on the last day of the month. Atop the Pacific Division the San Jose Sharks missed the opportunity to stretch their lead when they were doubled up 4-2 by the Florida Panthers at the SAP Center in Northern California. The Sharks still lead the Calgary Flames by a point, but have now played one more game than Calgary. The Flames, 5000/1 to win the Western Conference, return to the ice on Friday when they entertain the New York Rangers at the Scotiabank Saddledome. Curiously San Jose and Calgary also meet on March 31st, in a match-up that is building into some significance.